President Donald Trump declared Tuesday that he had been vindicated, saying he was finally "proved to be right" about the dangers posed by Sweden's generous refugee policy. 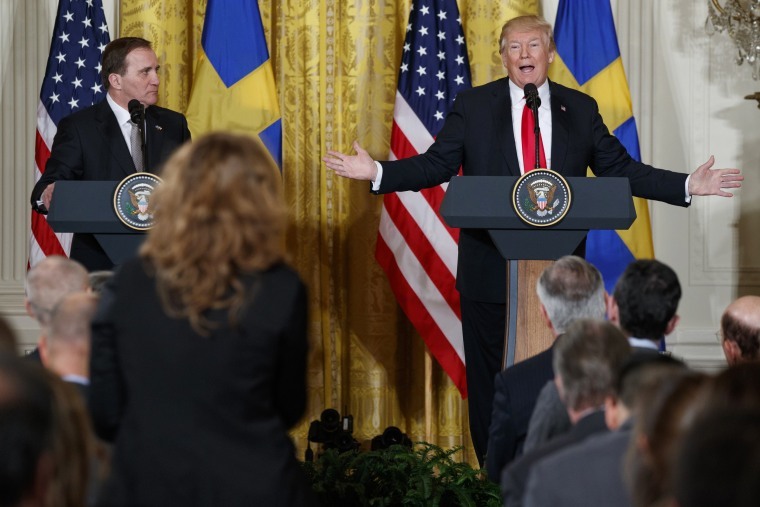 "Certainly, you have a problem with the immigration," Trump said at a White House press conference with Sweden's prime minister Stefan Löfven. "It's caused problems with Sweden. I was one of the first ones to say it, I took a little heat. But that was OK, because I proved to be right." The president's comments seemed to reference remarks he first made in February 2017 in which Trump seemed to suggest that a terror-related incident had occurred in the small Nordic nation — a claim that bewildered Swedish residents and officials. "We've got to keep our country safe," Trump said at an event in Florida last year. "You look at what's happening in Germany. You look at what's happening last night in Sweden. Sweden! Who would believe this? Sweden. They took in large numbers. They’re having problems like they never thought possible." Carl Bildt, a former Swedish prime minister, wrote on Twitter at the time: "Sweden? Terror attack? What has he been smoking? Questions abound." While the president didn't specifically cite a terror attack, he went on in his remarks to reference terror attacks in other nations, including in France and Belgium. According to the Swedish newspaper Aftonbladet, the night in question was marked by unremarkable news, including an alleged drunken driver, an avalanche warning and a famous singer having technical problems in rehearsal. But nothing terror related. The president later attributed his comment to a Fox News interview with a conservative filmmaker, while the White House claimed Trump was "talking about rising crime and recent incidents in general — not referring to a specific incident." Trump said last year he was referring to a Tucker Carlson segment that appeared on Fox News. In the segment, Carlson interviewed filmmaker Ami Horowitz, who had recently made a documentary about Sweden's refugee policy. The segment did not contain any breaking news about an attack or incident. At the time, the Swedish Embassy sought clarity from the State Department about what Trump was talking about, and it's not clear whether it ever received an explanation. Löfven, answering questions alongside Trump at the White House, acknowledged Tuesday that his country has had issues with organized crime, and that he has sought to reduce the number of refugees Sweden accepts.